As a versatile ingredient, I understand that you want to stock up on potatoes (I do, too). However, the potato is a type of perishable good – therefore, it will spoil over time. And it would be a waste of money if you are not able to use potatoes when they’re still in good condition. Today, you will learn how long potatoes are good for. You will also discover many new ways on how to store potatoes properly (so as to prolong its life). How Long Can Potatoes Last? Status – Potatoes are either raw or cooked. Freshly bought (or harvested) potatoes have longer shelf life than the cooked version. Note that potato dishes actually spoil fast. 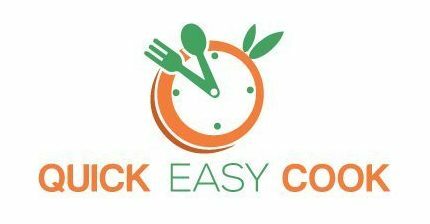 Storage – Whether raw or cooked, your chosen storage method will affect the life of raw potatoes and cooked potato dishes. Preparation – Preparing potatoes for cooking involves peeling and washing them. Sometimes, you will need to soak them in water first. 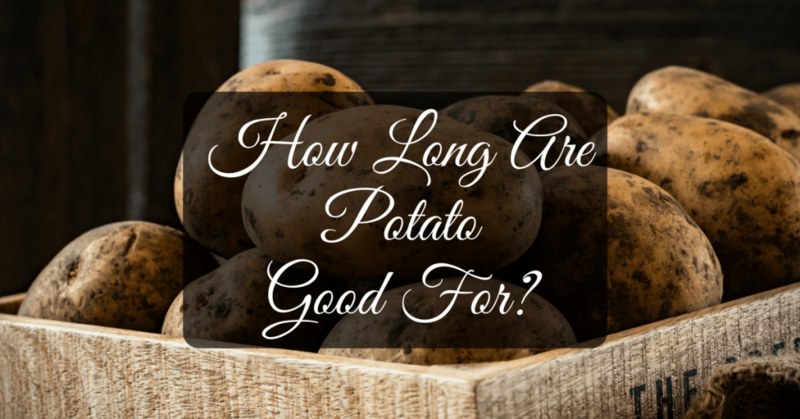 When prepared properly, potatoes will have longer life spans. In general, raw potatoes can last up to 2 weeks at room temperature setting. Sweet potatoes have longer shelf life than regular potatoes. They can last up to 5 weeks at room temperature. And when refrigerated, sweet potatoes can last up to 3 months. Russet potatoes can last up to 5 weeks at room temperature. If you refrigerate Russet potatoes, they can last up to about 4 months. Red potatoes can remain fresh at room temperature for about 3 weeks. If refrigerated, they can stay fresh up to 3 months. Cooked potatoes (in dishes) remain in good quality up to 3 hours after cooking (at room temperature). It’s advisable to store uneaten portions of potato dishes in the fridge within 2 hours of making it. Baked potato dishes can last up to 7 days in the refrigerator. If stored in the freezer, they can last up to 8 months. In the previous section, I told you the average life spans of different types of potatoes. I also gave you some idea as to how long cooked potato dishes can last. In this section, I will give you some pointers on how to prolong the life of potatoes so that they will last longer (instead of spoiling quickly). The best place to store potatoes is in a cool dark place with a temperature setting of about 40 to 50 degrees Fahrenheit. If you have a cellar, that is probably the best place to keep your potatoes as this is the usual temperature settings of cellars. If you’re going to place potatoes in a paper bag, make sure that the bag has holes in it. There should be proper air circulation inside the bag so as not to expose the potatoes to a humid condition. Keep potatoes dry and do no wash them before storing. Washing potatoes will only speed up the process of spoilage. Do not peel, cut open or slice potatoes if you’re not going to use them yet. Exposing the flesh to air can lead to oxidation (that’s why the color turns into brown). Peeled potatoes can be submerged in water to avoid exposure to air. Peeled potatoes that are soaked in water will not last very long. These should be used in a day or 2 (and placed in the refrigerator). Cooked potatoes can be frozen for a long time. 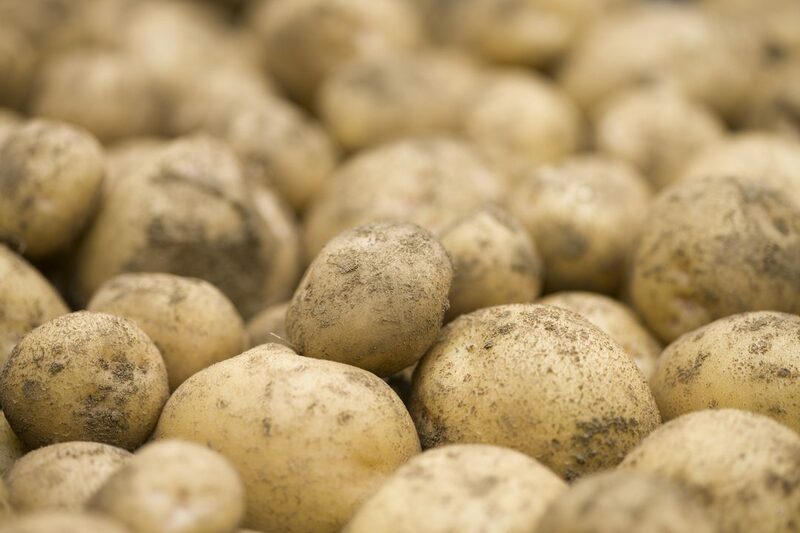 Skin condition – Fresh potatoes have tight skins. If they’re already bad (or are spoiled) their skins will be loose and wrinkled. There could also be spots all over the potatoes’ skin. If this is the case, the potatoes have already gone bad and need to be thrown away. 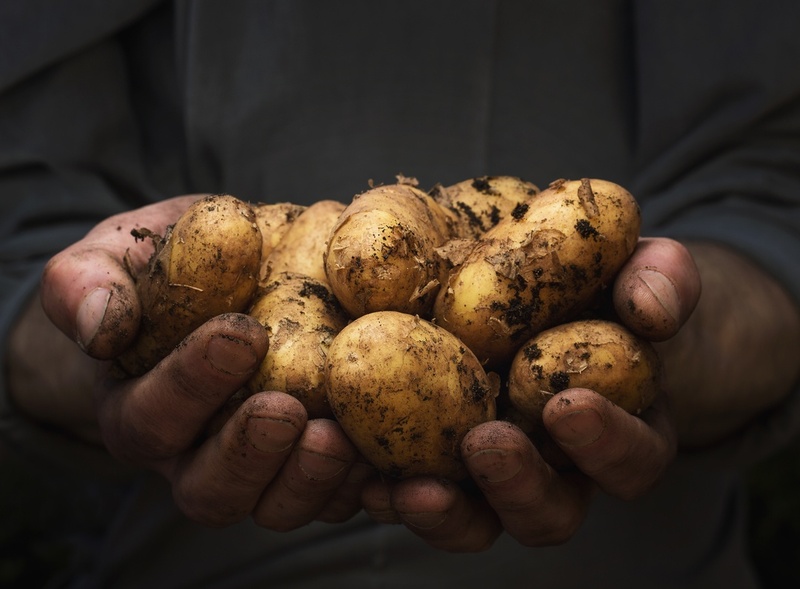 Smell – Freshly harvested potatoes have earthy scent. When already spoiled, the potatoes will start to smell bad that you will not be able to stand its smell. Signs of sprouts – Having signs of sprouts or growths of new potatoes is a sign that the mother potato is already dead (or dying). In some cases, you can still use some parts of the potatoes (those parts that are still firm). Texture – The overall feel of potatoes is firm and hard. If your potatoes are already soft, They’re already bad. Sign of mold – Mold in food is never a good sign – and the same holds true for potatoes. If this is the case, it would be wise to just throw away the whole potatoes (those with mold) as they have already been contaminated. Cooked Potatoes Texture – In cooked potatoes recipes like mashed potatoes, one sign of spoilage is if the liquid part of the mixture is already separating from the solid, firmer consistency. Smell of Cooked Potatoes – Potato dishes that have already gone bad have stinky smell. They can particularly carry a sour smell. While refrigerating potatoes will extend its life, it’s not the best condition to keep potatoes in. The usual temperature inside the fridge is 32 to 40 degrees Fahrenheit – so, this is a little colder than the ideal setting. Placing potatoes inside the refrigerator will also expose it to moisture and cause its color to become dark (and unappealing when cooked). Also, the starch content in potatoes can convert into sugar while still uncooked (not good for health). Yes, you can keep potatoes in the pantry (with normal temperature settings of 50 to 70 degrees Fahrenheit). However, if you’re living in a humid area (or if it’s summertime) the high temperature can cause early deterioration in potatoes. Remember that potatoes are 80% water, and being placed in hot/ dry places will cause its water content to evaporate quickly. The potatoes will then dry up, get rotten, or start to sprout. It is not advisable to freeze raw potatoes.When picking potatoes from the grocery or vegetable stand, get those pieces that are unbruised. Cuts and peels on potatoes will expose them to air (and oxidation) and make the process of spoilage faster. Avoid getting potatoes that are already starting to have sprouts. While the body and texture of the potatoes can still be firm, having sprouts is a sign that the potatoes are about to deteriorate. Store potatoes away from onions. These two are composed of chemicals that react against each other – and as a result, both will spoil and deteriorate quickly. If you notice a few rotten potatoes in a batch of good potatoes, remove these quickly. Leaving spoiled potatoes with good ones will cause the deterioration of all the others. Place a layer of potatoes in a baking dish. Add a layer of bacon. Add cream on top of the bacon. Add some green onions over the cheese. Add another layer of potatoes. Add another layer of bacon. Add some more green onions over the cheese. Add some cubes of butter. Cover the dish with a foil. Bake in preheated oven at 350 degrees Fahrenheit for about an hour. Remove the foil and bake for another 30 minutes. Cut the potatoes in similar sizes. Cook the potatoes in boiling water. Mash the potatoes using a potato masher. Heat milk and butter in a saucepan. While still hot, add the milk mixture in the hot mashed potatoes. Cut the potatoes in bite sized pieces. Cook the potatoes in a steamer. When done, transfer to a bowl and allow to cool off. For the dressing, combine the mayonnaise and other ingredients. Mix well. Add the potatoes to the mixture and stir everything up until well combined. Now that you know how long potatoes last and how to prolong their life, I hope you are able to stock up on them. As you can see, there are lots of potato recipes that you can make with this versatile crop. And most people enjoy eating potatoes (even kids). Let me know what you think by leaving a comment below. You can also share this post with your friends if you think it will be useful to them, too.